I know, I know, two posts in one day?! 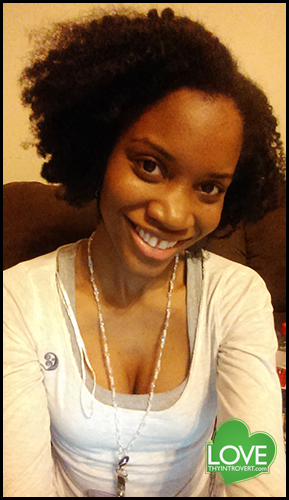 But I was really excited to introduce to you my newest beautiful natural head…Ms. Rae! Rae is an “Old Timer” natural who works in field of Instructional Design, runs (owns) the beautiful blog Love Thy Introvert and if that wasn’t enough she also admins the inspiring blog The Natural Hair Blog Directory . She did me the honor of allowing me to feature her hair journey which can be read here. In case natural hair interests you (which I am guessing it does!) or perhaps you want to delve into the world of understanding personalities, instructional design, life or Christianity then Love Thy Introvert is the blog for you. I would also recommend that you check out The Natural Hair Blog Directory because the amount of inspiration you can get through all the bloggers and vloggers on there is incredible! Thank you for sharing your story with us Rae! This entry was posted in Feature Stories, Featured Naturals, Features on Maicurls, Inspiring Others, Natural Hair Journey, Natural Hair Story and tagged Feature Story, Featured Naturals, Features on Maicurls, Natural Feature Story on April 17, 2014 by Maicurls.